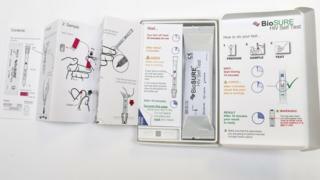 HIV self-testing kits are now available to buy on the High Street for the first time, a retailer has announced. Superdrug said it is now selling the BioSURE test, which provides a result in 15 minutes, in all of its 200 pharmacy stores in the UK for £33.95. It had previously been available to buy online after becoming the first legally approved self-testing kit in 2015. An HIV charity welcomed the announcement but added that many people would be unable to afford the test. However, free testing is available on the NHS. The BioSURE test requires a small amount of blood from a finger prick sample to detect the presence of HIV antibodies. Making it more widely available will help reduce a person’s waiting time between taking the test and their result, and could increase early diagnosis, Superdrug said. Experts say that while these home-testing kits are highly accurate, positive results must be confirmed at clinics. Improvement in treatments for HIV have made the disease more manageable, but late diagnosis can have a devastating impact on health and life expectancy. In May, the Terrence Higgins Trust launched a six-month programme to enable people in high-risk groups to order free HIV self-testing kits. The charity has estimated that there are 10,400 people in the UK who do not know that they are living with HIV. This means they are not on effective medication and could unknowingly be passing on the virus. Marc Thompson, health improvement lead at the charity, said: “Around one in eight people living with HIV in the UK remain undiagnosed, which is why we strongly welcome anything that increases access to and awareness of HIV testing. “But not everyone can afford to buy a kit, and it’s important to make clear that you can test for free at any sexual health clinic. Free testing for HIV is usually offered by sexual health clinics, some GP surgeries, drug dependency services and charities like the Terrence Higgins Trust, as well as when women are pregnant.